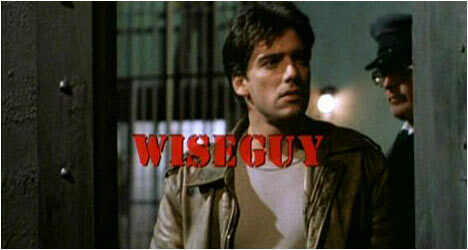 Along with Crime Story, Wiseguy was one of the earliest attempts at creating multi-episode story arcs on American network television during the 1980s. Up until that point, conventional wisdom was to have stand-alone episodes, that way a show could easily be shown out of sequence once in syndication. Both shows featured high quality writing and a strong cast supported by an equally impressive roster of guest actors, many of whom went on to bigger things in cinema. Wiseguy was a crime show that ran on American television from 1987 to 1990 and featured the exploits of Vincent “Vinnie” Terranova (Wahl), an undercover agent working for the Organized Crime Bureau (OCB), a division of the FBI. His job was to infiltrate criminal organizations, gather evidence, destroy them from within, and bring those guilty to justice. Co-created by T.V. mogul Stephen J. Cannell, Wiseguy broke the mould for crime dramas. The first season featured two of the show’s most memorable arcs. Upon being released from prison (to establish his criminal credentials), Vinnie is assigned to infiltrate the Sonny Steelgrave (Sharkey) organization after his son Dave killed Vinnie’s training agent who had previously been investigating the crime family. Vinnie gradually works his way up and manages to gain Sonny’s confidence. Ray Sharkey is quite good as the unpredictable crime boss who constantly keeps Vinnie on his toes. He’s understandably cagey as deals get busted and henchmen are killed. Vinnie answers to Frank McPike (played with wonderfully sarcastic dry wit by Banks) and he is the one that assigns Vinnie his cases and supplies him with crucial information. Vinnie’s other contact is Lifeguard (Bynes), whom he contacts on a regular basis with updates on the case under the guise of Uncle Mike, in case the phone is being tapped. One of things that is so good about Wiseguy is that it takes the time to show how being so deep undercover takes its toll on Vinnie. He comes so close to death on a regular basis and has to be a hell of an actor because his life depends on it. The first season’s second story arc, and arguably the best one of the show’s entire run, saw Vinnie go after the multi-billionaire international arms dealer Mel Profitt (Spacey). In the process, Vinnie uncovers a crime syndicate in a whole other league than anything he’s experienced before. His way into this particular organization is through assassin Roger Loccoco (William Russ), who works for Profitt. Through him he meets Mel’s beautiful sister Susan (Joan Severance) who introduces him to Mel. Not surprisingly, the one to watch is a young Kevin Spacey as the crazy, power-hungry Mel. He’s a larger than life criminal mastermind seemingly coming apart at the seams and yet manages to just keep it together enough to run his vast empire – thanks to Susan and a regular shot of heroin. Spacey does a fantastic job giving depth to this first class nutjob, knowing when to chew up the scenery and when to pull it back. At the end of season one, burn-out from a grueling undercover assignment, Vinnie threatens to resign. Frank puts him on a six-month extended leave of absence instead. Vinnie decides to return home to Brooklyn in an attempt to clear his head and enjoy some semblance of a regular life. Meanwhile, Frank gets promoted and his superiors put pressure on him to bring Vinnie back to work. After a short story arc that saw Vinnie deal with a small group of white supremacists trying to take over his neighbourhood, Wiseguy settled into its next memorable storyline. Eli Sternberg (Lewis) and his son David (Silver) are clothing manufacturers struggling to reach a deadline on an order and need a lot of money fast. Eli makes a deal with Enrico Pinzolo (Tucci), a local businessman/loan shark who controls the garment industry via trucking. Unhappy with what his father has done, David asks the OCB for their help and in doing so help them bring down Pinzolo. Comedian Jerry Lewis holds his own and shows off his dramatic chops against solid character actors like Ron Silver and Stanley Tucci. It’s great to see these guys bounce off each other and sink their teeth in this excellent material. Season three begins with Vinnie’s stepfather and Mafioso boss shot and gravely wounded in a mob hit. When another don his hit, Vinnie teams up with the head of a rival family (Davi) to find out whom from one of the other families ordered these hits. Robert Davi, who’s appeared in a lot of crappy films and T.V. shows, gets a meaty role to demonstrate what an underrated talent he is by eloquently delivering substantial monologues and playing an honourable tough guy. After Ken Wahl had a dispute with the show’s producers and left the show before the start of the fourth season, his character was written out and replaced with the much less interesting Michael Santana (Bauer), a United States attorney based in Miami. When his case against a powerful leader of a drug cartel falls apart due to a flawed arrest warrant based on information illegally beaten out of an informant, Santana is disbarred. McPike seeks him out in order to help find Vinnie who has run afoul of the same cartel. While Steven Bauer is a fine actor, it was hard to empathize with his character like you could with Vinnie whom viewers had grown attached to over three seasons. The ratings declined and Wiseguy was canceled after this season. Watching these episodes again reminds one of just how good Wiseguy was back in the day and how it paved the way for crime shows like The Sopranos and The Wire. Much like the previous first season box set, a lot of the original music has been replaced with much cheaper substitutes. However, this really doesn’t detract from the engrossing storylines or fascinating characters. However, one entire story arc has been excised entirely due to original music rights issues. This was the storyline that saw Vinnie going undercover to bust a corrupt English record mogul played by Tim Curry and featured the likes of Debbie Harry and Glenn Frey in supporting roles. Its omission is sorely missed.